Conheça o melhor da Cidade antiga de Québec nesta excursão de bicicleta guiada de 2,5 horas. Desfrute de uma relaxante excursão de 13 km (8 milhas) pelo distrito da Cidade Baixa antiga de Québec, aprendendo sobre sua história de 1608 até os dias atuais. Conheça este Patrimônio Mundial da UNESCO, com comentários educacionais e divertidos do guia experiente. Visite a popular Place-Royale, o Sítio Histórico Nacional Cartier-Brébeuf, as ruas de paralelepípedos de Petit Champlain e muito mais, enquanto admira a beleza natural da cidade ao longo do Rio Saint-Charles. Bicicleta, capacete, garrafa de água e lanches estão incluídos. Encontre e cumprimente o guia da excursão e o grupo em uma loja de bicicletas no bairro da Cidade Baixa antiga de Québec. Depois de se equipar com uma bicicleta e capacete, haverá uma breve orientação de segurança antes de iniciar a excursão de 2,5 horas pela Cidade Baixa, um Patrimônio Mundial da UNESCO. Esta excursão relaxante cobre 13 km (8 milhas) em terreno plano e ideal para bicicletas. Pedale ao longo da zona portuária até o revitalizado Porto Antigo e o Musée de la Civilisation (Museu da Civilização), o museu mais popular da cidade de Québec. Em seguida, continue para a Place-Royale, o primeiro assentamento francês permanente na América do Norte. Longe da agitação dos grandes shopping centers está o Quartier Petit Champlain, com as suas muitas boutiques, cafés e restaurantes de pedra ao longo das ruas de paralelepípedos. De lá, parques urbanos pitorescos abrem caminho para as margens do Rio Saint-Charles e do Sítio Histórico Nacional Cartier-Brébeuf, um belo parque da cidade na margem norte do rio. Despite the poor weather, we had a great time on this interesting and informative tour. Bikes were great, and our guide was very knowledgeable. Highly recommend. Simon, the English bike tour guide, was excellent. He and his colleague accommodated the fact that my wife was having difficulty keeping up with the others in a very cheerful manner. He gave us some interesting historical facts about the places we stopped at and even gave us a good recommendation for a microbrewery La Barbarie! Terrific trip, our guide, Denis', was informative and enthusiastic. The ride itself was a joy, a great way to get the lay of the land in Old Quebec. La gentillesse de l'accueil, le sourire, le bon matériel... Parfait! J'aurai aimé un peu plus de commentaires sur la ville et son passé par notre guide, qui était charmante. This was a great tour for my entire family! I have two kids, ages 13 and 9, and both loved the tour and felt they got a lot out of the history and sites. Uli, our guide, was fantastic as she was thorough in her instructions when biking, her knowledge of the city and showed a great interest in making sure my kids - who were the only kids on the tour - were attended to the entire time. Would do this tour again in a heartbeat! Thank you!! We had a wonderful time riding through lower town with our tour guide Denny. It was a great opportunity to chat with a local and get his perspective on all sorts of interesting topics. Quebec City is well set up for biking with bike paths through beautiful parks and along the river. There were only 3 in our group, so we felt like we had our own personal tour guide. This was definitely the highlight of our trip! Our guide Guy was great. A cold windy day but great sites and history. Would highly recommend. One of us was not a regular bike rider but he adjusted the tour and we all had fun. Great guide and a great way to learn about the city while being active. A lovely way to learn and see. Wonderful trip with a knowledgeable guide . Only a short walk from the cruise terminal , we were lucky that Sunday morning as my wife and. We're the only two people on this tour . Both of us being in good shape we were able to see a lot more of Quebec on bike than most . I would highly recommend this trip and this company , top notch from start to end . 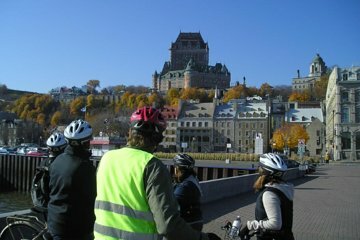 This bike tour is a great way to see lower town Quebec City as well as to learn about its history. SImon was a fantastic tour guide. I highly recommend this tour!